The three hookbaits concentrated on this area were kept relatively small in order to blend in with the loosefeed and be easily taken by any bream as well as the carp should they come across the baited area. I also varied the hookbaits on each rod as I’ve found that different fish have different preferences and offering a choice of bait can lead to more fish being caught when you expect plenty of fish turning up on your feed. The first hookbait was a 10mm Source bottom bait tipped with a single piece of buoyant yellow Enterprise plastic sweetcorn that’d been soaking in a tub of pineapple flavor and sweetener, the second a 10mm Sweet Tiger fluro pop-up that had been soaked in tiger nut hookbait dip and the third a 10mm Red-amo bottom bait (that later in the session I also enhanced with Enterprise imitation corn). The end-tackle was kept fairly simple, but with proven effectiveness; size 8 Fang hooks fished blowback style on 6” hooklinks of 20lb Nash Combilink, and 3.5oz dumpy pear leads attached to safety bolt beads. As I could use four rods and had plenty of space in the swim I also tried to cover an extra ‘base’, just in case, by fishing another bait off to the right of the swim much closer in at the base of the near shelf. On the first evening a few carp started to show at range and it wasn’t too long after when the first run of the session occurred. This resulted in a relatively small 12lb+ common, which turned out to be the first and smallest of several carp overnight. By dawn I’d added a further two “doubles” and a nicely scaled 20lb 8oz mirror. The sun pocking itself above the tree-line on the horizon seemed to kick-start the carp into another period of action which started off with a hard fighting 29lb 2oz common before two further carp in the “upper doubles” bracket came to the net. The middle period of the day appeared to be the quietest in terms of bites, so this is when I opted to put the spod rod to work again, topping up the swim with a further generous helping of loosefeed. I’d got a meeting to attend on the Thursday evening, so as already arranged with the fishery management I left my gear under the watchful eyes of a couple of nearby ‘minders’ and early evening drove back to Northampton for my meeting, before arriving back at the fishery just after midnight. Once back in the swim the rods were soon cast back out to the spots, with skyline reference points and the correct distance indicated on each mainline with neat marker-knots of thin pole elastic helping to make the job relatively easy. By dawn I’d netted a couple more ‘doubles’ on the plateau baits and it was yet again another run on a plateau bait later in the morning while I was sitting in the doorway of my bivvy enjoying a brew and a catch-up with my mate Ian that produced a nicely framed common that looked as though it might just go “30’s”, but missed the mark by just 8oz. Rather than detailing a “blow-by-blow”, suffice to say that the rest of the session continued along a similar style, with all of the fish being carp and all coming off the big bed of bait out on the plateau. The rod fished further in didn’t produce a bite and was eventually retired. The vast majority of the bites came either at night, from late evening until first light, or during the morning period. I kept re-baiting the swim on a regular basis, introducing at least half a bucket of loose feed each 24hrs. The carp didn’t appear to be particularly choosy about the hookbaits, so long as I kept them relatively small and matching up with items that were being put out in the loose feed. Interestingly, it seemed as though a more visual pop-up would usually produce the first run of each bite-time period, but the larger fish tended to fall to a 10mm bottom bait fished in conjunction with the flavored Enterprise buoyant sweetcorn. It was quite hard work at times ensuring that I kept the swim well fed and that the plateau hookbaits presented correctly and in the right places, especially when there was quite a stiff breeze pushing into our bank at times. By the time it came to packing up early on the Sunday morning I was aching and painfully aware of the arthritis in my shoulders, arms and back. 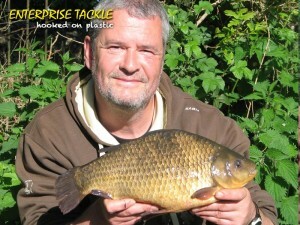 However it was all good fun and very rewarding, and it’s sessions like that that can keep you satisfied and motivated later in the year when the fishing is slow and a bite or two seems to be a virtually impossible achievement. 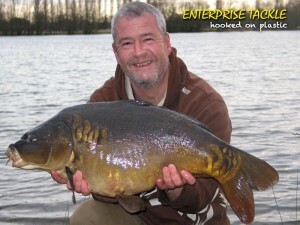 The total result was 22 carp over the session, consisting of 15 doubles and 7 “20’s”; the best two going 29.02 and 29.08. Ian, who’d moved in to the swim on my right on the Friday morning, chipped in with a mid-twenty on the Saturday and of course the social aspect and “banter” was excellent and helped to make a really good session totally memorable. 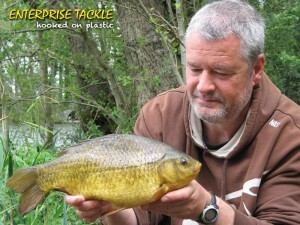 In fishing, terms May was all about a concentrated effort to try and catch a big crucian carp. Clearly Johnson’s Lake on the Godalming AC ticket down in Surrey has been the place to be over the last few years if you want to catch a giant crucian and it’s probably true to say that if you want the majority of the crucians to be at their heaviest weight of the year, then catching them prior to spawning is the time to do it. I’d been a Godalming member for a few years, but I’d only managed to fish Johnson’s on three separate occasions and the opportunity to have a go for the lakes crucians prior to their annual spawning rituals had not been a realistic proposition until this year. The lake wasn’t open for the new season until 1st May, and considering that the crucians are often early spawners in this shallow, silty, estate lake type venue has meant that the window of opportunity between the ‘opening’ and the start of spawning for the crucians has in the past been as short as a week or two. Therefore, if I wanted to give myself the best possible chance of a proper heavyweight, then I needed to get myself down as early as possible. May 1st fell around the Bank Holiday this year and my other commitments meant that being there for the start of the season wasn’t going to happen. However I got things organized so that I could travel down the day after the Bank Holiday for my first session. The crucian fishing on Johnson’s had been excellent over the first few days and despite many blanks some of the anglers had clearly been in the right swim at the right time. Some of the guys who’d managed to locate the tightly grouped pods of fish had really got amongst them and had caught some great bags of fish, or some massive specimens, so I was really keen to get started myself. Unfortunately enthusiasm counts for nothing if you’re not in the right swim and my first two day session for the crucians came to an end with plenty of tench and several 20lb+ carp to over 25lb on my crucian rods, but the crucians themselves appeared to “do the off” as soon as I had set up. Undeterred by my lack of success at the initial attempt, but spurred on by the fact that there were still some very big fish being caught here and there, including a potential new British record crucian weighing 4lb 10oz., I stayed down in Surrey and organized myself for a second session on the lake starting again as soon as the fishery rules allowed. However the results from the second session were similar to the first and despite plenty of tench I couldn’t catch a crucian. As the weather was warming up, but the crucians had yet to spawn I made the effort to get back down to the lake the following week. 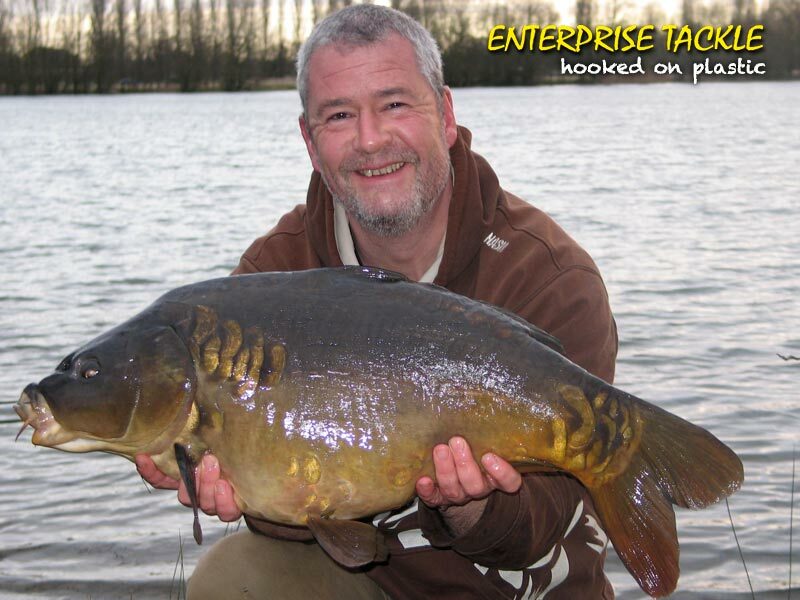 The general sport with the crucians was clearly starting to slow up, but they still appeared catchable with the right baits and methods, so long as you could find yourself in a swim with some crucians in residence. 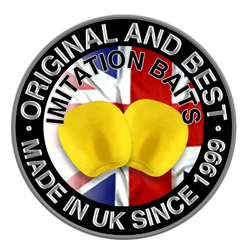 Most of the anglers who were targeting the crucians were using flat method feeders, short hooklinks and varying the hookbaits, but with either artificial castor, corn, pellet or maggot being some of the most popular choices. My own tactics were similar, but I was favoring a mini-helicopter type set up where I could simply mold my method mix around the lead and I was also nicking a little PVA mesh bag of pellets onto the hook on each cast for a bit of extra attraction around the hookbait. I was also starting to experiment with the hookbait, as I reckoned most of the specimen crucians had already been caught at least once since the start of the new season and may be starting to shy off some of the more regular options. As far as the tench were concerned my most successful alternative hookbait of all was a small snail from a tin of Dynamite “Hemp and Snails”, fished on the hair with a small piece of yellow plastic cut from an artificial bait acting as a visual aid and a stopper ensuring the snail wasn’t lost on the cast. At one stage I had almost non-stop action from the tench for a 4 hour period, where I could barely get sat down again after putting the rod back out before another tench steamed off with the bait. I even managed to catch my first crucian of the year, a low “3”, on this particular hookbait, so it became my default choice on at least 1 of the 2 rods after that. It wasn’t long before both the regular carp and the crucians were showing signs that they might have started spawning and the numbers of anglers rapidly dropped off. I also wondered whether I should quit the crucian campaign for this year and save further efforts for my first “4” until next year, but I was still keen for another go and at the next opportunity I was loading up the car and heading off back down to the lake. I started off fishing a couple of day sessions and moving to different swims to try and locate the better crucians, but without any initial success. With most of the crucian population having already spawned, it looked like time was running out for the chances of a 4lb+ fish. For the last couple of days of my stay I got myself installed in a swim that had looked very favorable the previous day. Action wasn’t instantaneous and I was just starting to wonder if my swim choice had again been a poor one when the alarm on the rod fishing the snail/plastic hookbait suddenly sounded. I was soon aware that what was on the end felt like a really big crucian and when I got my first look at it in the water it looked so big in comparison with my 3.06 PB that for a second I wondered if I’d hooked the fish that was the potential ‘record in waiting’. I quickly came to my senses and figured that it wasn’t quite that big, but the fish I was attached to was clearly a PB and quite possibly a fish over the magical 4lb mark. I was physically shaking while playing that fish, but fortunately it ended up in the net and I could start to breathe again. Once I’d got it on the unhooking mat it was clear that for some reason this particular crucian hadn’t yet spawned and was not only very plump around the belly, but bulky around the entire body. The scales showed that 4lb+ plus wasn’t in doubt, with the needle indicating a reading a little closer to 4.02 than 4.01, but I was more than happy to settle on calling it 4.01 and my target achieved. A few quick photos later and I was left to recast and sit back feeling very satisfied with myself. However I wasn’t relaxing for long as within a fairly short time I was attached to another good crucian which sent the scales spinning round to 3.06. Despite several tench, that was it for crucians on that day, but the following day I had another brace of good crucians weighing in at 3.07 on the snail/plastic hookbait and a 3.03 on sweetcorn before it was time to pack up and head for home. I’ll try and catch up with what’s been happening in June and July in my next piece.